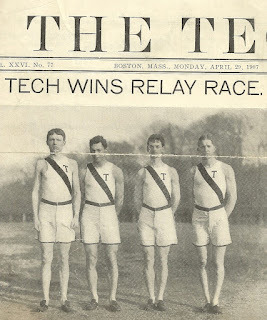 In response to Alan’s wonderful shot of the three (maybe four) sportsters, may I present this quartet of runners – the Massachusetts Institute of Technology (MIT) varsity relay team of 1907! 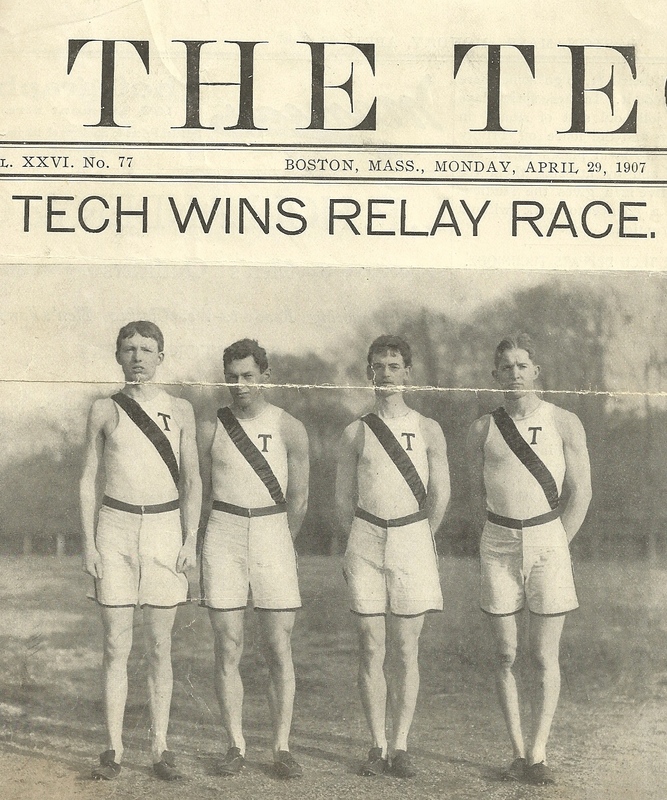 That sturdy fellow second from the left is my grandfather (and Team Captain) Gardner S. Gould, MIT Class of 1907. “Victory was the result of the relay team’s trip to the Penn games. Close in every relay, with a fast total time, the best quartette of quarter-milers in years carried off first honors in a mile relay against Wesleyan last Saturday, at Franklin Field, Philadelphia.... Gould got the jump on his man and gained steadily, coming through with a lead of 20 yards. The time for this quarter was 54 4-5 s. Gould relayed to Gimson...” (third from left in the photo). Most of you know that I’m writing another book, a novel that spans roughly a century between the early 1800s and the early 1900s. What you don’t know is that I spend at least an hour every day doing research of some kind or another. There’s a lot to learn, and not all of it is of the earth-shattering, history-changing variety. Truth told, most of it is pretty slow stuff; clothing, food, farming technology, sheep breeds, crop rotation systems, stone wall physics, different styles of wagons and chaises, etc. But getting it “right” matters – not only to me, but to others who read historical fiction. This morning I spent an hour or so reading about 19th- and 20th-century American slang – after all, if my characters are going to talk to each other, it’s important that they use the common expressions of their time. Some slang is very clever and funny (but on the saucy side and, therefore, unprintable); some of it is simply puzzling. Louis Prang was born in 1824 in a Province of the Kingdom of Prussia. His father was a textile manufacturer, and Louis grew up comfortably in that trade, working with his father for many years. After a while, his youthful political activities irritated the Prussian government (he was a bit too revolutionary for his time) and he was forced to emigrate, first to Switzerland, then to Boston in 1850. He became a fairly successful lithographer, carving wood engravings for book illustrations. He eventually started his own business, L. Prang and Company, working in advertising and other business art. The company also printed maps, some of which were used (by both sides!) during the Civil War. In 1873, he started printing Christmas cards – he is often referred to as the Father of the American Christmas card – and also manufactured a series of what were called “album cards,” which were used in scrapbooks. (Scrapbooking is nothing new, although the use of the gerund form certainly is trendy: I have several of my great-grandmother’s diaries in which she often mentions an evening spent “pasting scraps.”) I’ve stumbled across quite a bit of Prang’s work in scrapbooks I’ve found in flea markets and antique shops. I’ve got a few of his Christmas cards, too, and I’ll post some in December! Louis Prang relocated his Massachusetts company from Roxbury to Springfield in 1897. He died in 1909 and is buried in Forest Hills Cemetery in Jamaica Plain. This card depicting the Muses was one of Louis Prang’s scrap album cards. The Muses were the goddesses who ruled over the arts and sciences. They are known collectively as the younger muses, and they influenced poetry, music, tragedy, comedy, dancing, astronomy, astrology, etc. There were usually nine muses, but this card has ten. So, which one is the interloper? Make your guess in your comment, and feel free to be wickedly creative! Every now and then, I pour myself a cup of coffee, shuffle into my office and settle down in front of the computer for some Blog Time – not to write and post on my blog, but to search for interesting blogs that others have posted. A lot of what’s out there doesn’t interest me in the slightest, but a lot of it does. Occasionally I’ll stumble upon a blog that grabs me by the throat, and when I do, I create a shortcut for a folder on my desktop so that it’s easier for me to go back and visit again and again. Sepia Saturday is one of those throat-grabbers. Their message is simple, yet hugely important: we have a responsibility to preserve not only photographic documentation of our ancestors, but also social documentation – the stories of their lives and their contributions to the society in which we live and to the people we have become. Each Saturday, Alan & Kat post a photograph. There’s usually a theme (or several themes) connected to each photo: bicycles, occupations, time, hats, doorways, etc., and bloggers from all over respond to that photographic theme by posting photos of their own on their own blogs! You can follow those responses through links on Sepia Saturday’s site. 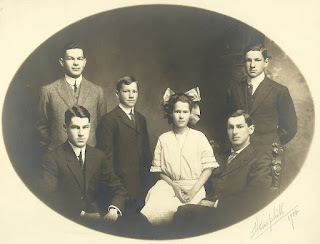 Today they posted a great 1901 shot of a man and his two sisters; in turn, I offer a 1912 photograph of Margaret Sylvester Gould and her five brothers, one of whom -- the one sitting in the chair on the right -- was my grandfather. The boys are Howard, Allen, Richard, Prescott and Gardner, and they lived in Newton Upper Falls, Massachusetts. About two weeks ago, I made a stop at one of my favorite flea markets and bought a small collection of newsprint ephemera – a food storage baggie crammed with three folded Boston area newspapers from the 1930s and 1940s: A section of The Boston Sunday Globe and the tabloids The Girls’ Companion and The Boston Sunday Post Fiction Magazine. And there, on the front page of the April 4, 1943 edition of the fiction magazine, “The Siren Sea,” heralded as A Vivid Serial of Love and Hatred in the South Sea Isles. Hmmm, I thought, that’s pretty fiery stuff for 1943! I slipped it out of the baggie and opened it up; I saw the author’s byline just below the fold, and nearly dropped the paper on the floor: Ben Ames Williams! Williams (1880-1953) was born in Macon, Mississippi, but moved with his parents to Jackson, Ohio, where his father was editor of the local newspaper. In 1904, he was in Newton, Massachusetts, where he attended the Allen School (three of his schoolmates were my great-uncles). He was a member of the Class of 1910 at Dartmouth. After graduation, he went back to the Boston area to work as a stringer for various newspapers, then became a full-time reporter for the Boston American. That was just his day job. His real calling was fiction, and he wrote lots of it. Although he collected a box of rejection letters (sound familiar?) he kept at it, and finally published his first story in 1915. The Saturday Evening Post (a big leaguer in the early part of the 20th century) published much of his work, first in 1917, then 150 times more in the next twenty-odd years. Anyone who reads historical fiction has read one of his most famous works: Come Spring (1940), the fictional account of the settling and founding of a town in Maine (said to be Union, Maine). It’s now out of print, but you can borrow it from the local library and still find copies in used book stores, flea markets and antique shops. I loved Come Spring. It was the first work of historical fiction I read that did not focus on armies or presidents or land treaties or bloody battles or helpless women. It was, instead, about common people living common lives; about the hard work and determination of ordinary people living in a Maine community more than two hundred years ago. And that’s my kind of history.